The March Digital Dún Laoghaire MeetUp was the most successful yet. It was held during the official Dún Laoghaire Rathdown Local Enterprise Week 2017. 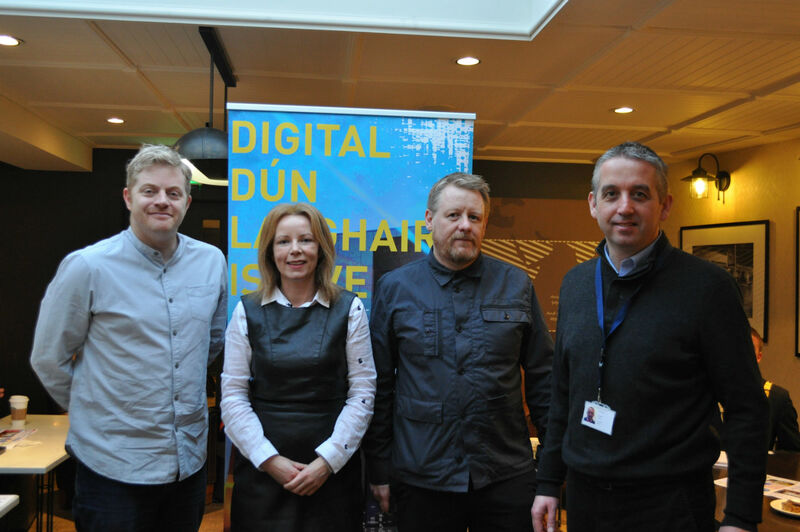 Invited guests included Cormac Devlin Cathaoirleach Dún Laoghaire Rathdown County Council and Cathy McGovern, MD Inspiration Marketing and Chairwoman of the Irish Internet Association (IIA). Why ‘Good’ design is essential to growing your digital business. Key insights were shared on this complex and multifaceted subject by experts John Moore, CEO, Clickworks, David Smith, Head of Faculty Film, Art & Creative, Dún Laoghaire Institute of Art, Design and Technology (IADT) Brian Cleary, Managing Director, Bank of Ireland Payment Acceptance and other attendees . What makes ‘Good’ Design and does it work better for online companies than traditional companies? John Moore, explained that good design is subjective and when something appears to be really easy. Design is even better when it’s pre-empted and a step ahead of the user. Good design makes things easy, and better. It can be a driver for improvement. On the impact of good design, online or offline John Moore said that it’s equally important for both. The difference is in how it’s measured. Online design can be measured well by analytics, whereas offline is by footfall. Brian Cleary added that in his experience good design involves coming up with the right proposition. Its ensuring employees know everything about the customer. He agreed that it’s about also making an effortless experience for customers and merchants. Design can be practical and also invigorating. The IIA is the independent representative body for internet businesses in Ireland. How do designers help, and what knowledge do they bring with them? If you want to be different, design can help you to progress. In a crowded marketplace, good design and storytelling can help businesses to differentiate their offerings from their competitors. What is your favourite case study where design turned the business from an average business into a success story? David Smith, explained that if design is part of a company’s business proposition then it can be a successful company. Ultimately it must be a chain reaction action. An example is Birds Transport and Logistics in Northern Ireland. Design is a big aspect of this €3million business. This company’s main business is to provide holistic seaweed baths for its clients. They linked up with Dynamo Group a creative brand agency in Dublin. The designers developed a luxurious brand identity and packaging for their products. By doing this VOYA raised its profile, attracted more clients and increased its profits. This is another great example of business transformation through digital design. The company adds value for its customers by providing useful videos and tips on many motoring ‘How To’ topics. Is also a great example because it’s easy and safe and has good customer services. PwC Ireland recommends that Irish retailers adopt a ‘mobile-first’ strategy. They also advise that sales assistants on the ground can demonstrate deep product knowledge. That they are capable of checking other stores quickly and informing customers of real-time offers. Is one of biggest example of successful design in the world. This website has many case studies and design challenge examples. The UK Government Services body employed designers to create a unified brand identity for many of its departments, agencies and all of its customer touch points. They created a well designed, and easy to use online model. This is now proving to be very cost effective and successful. More people are getting more access to government services and information. John Cleary suggested that this could be a good design model for Digital Dún Laoghaire, that Dún Laoghaire needs to brand itself, talk itself up and get its message out. – Although sometimes perceived as a luxury, design has to justify itself. – Design is never a destination. – Take a wall in your building and map the whole customer journey from start to finish. – Carry out research and user engagement. – Talk verbatim to and test the customer, get their feedback and implement it. – Make sure customers are well taken of. – Embed/engrain design thinking into your business culture. – Avoid getting married to one design and getting stuck on it. – Don’t try to make it perfect. Get it out there and learn. – Don’t always commit to an end product. Look and see what everyone else has done. – Ensure your staff are motivated. – People always see the end result. – Avoid stock images, and use more real and personalised ones. As usual there were lively interactions, discussions, key insights, fresh ideas and many more takeaways during and after the monthly MeetUp. Everyone agreed that Dún Laoghaire is a great place to work. It certainly has the potential of developing into a thriving digital hub.